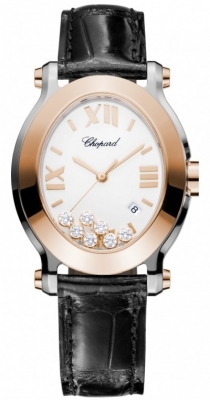 Polished stainless steel and 18kt rose gold case and bracelet. 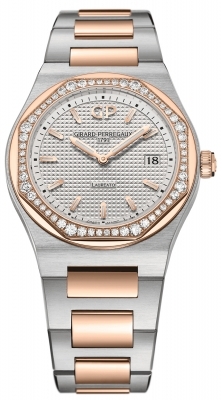 18kt rose gold bezel set with 32 diamonds weighing approximately 1.65 carats. 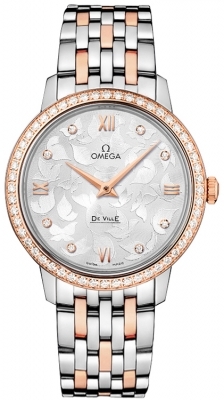 Natural mother-of-pearl dial with polished rose gold applied hour markers in a combination of Roman Numerals and indexes. Seven floating diamonds weighing approximately 0.35 carats. Single sapphire cabochon set in crown weighing approximately 0.17 carats. Displays date between 4 & 5 o'clock.